I may have mentioned once or twice that we have tickets this year for the "Sunday Plan" -- all the Mets' Sunday home games. On August 12, they played the Marlins, and the giveaway that day was a sports bag. I *gotta* have my free stuff! Maybe I'll have to make a separate posting of all the freebies I've taken home this year . . . after the post-season. Anyway -- I ended up with 4 of these sports bags: one each for me and Rich, and two from our guests that day, who for some reason didn't want a free bag. I can't understand why. So, one bag is for me to take to the gym and I took one out to Neil & Debbie, our usual seatmates, who couldn't make it on sports bag day. Now there are two left; I'm still not sure who will receive them, but one may end up as a personalized birthday gift for someone. First I had to do some sample stitch outs on a remnant of outdoor canvas. (This is why it's good to be a remnant junkie!) It was the closest match in texture and color to the material the bag is made of. Using the Quickfont feature in my 4D Embroidery software, I created a couple of fonts to test out -- Georgia Italic Bold (to match my blog title) and Banner (which matches my cards). I don't really like the 'z' in the Banner font, so decided Georgia was the one to use. I used a tear-away stabilizer and hooped the canvas and stabilizer together. On the first line, I used the "fix" function to baste the canvas to the stabilizer -- big mistake, because the holes do not heal themselves later (duh!). 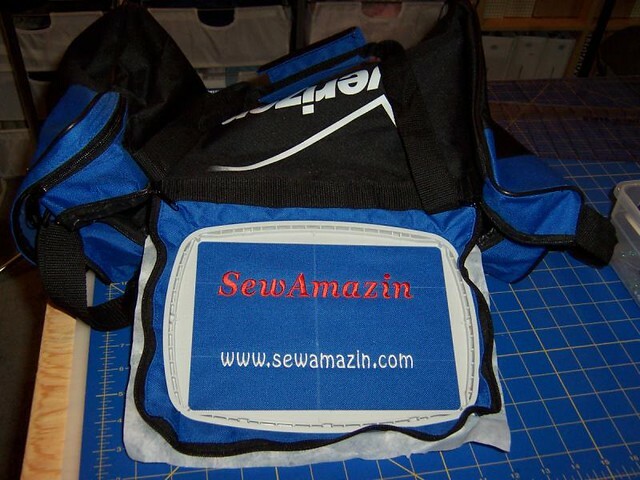 I also used a size 90 embroidery needle on this sample, but I didn't like the way "holes" around the stitches looked, so decided to use a 75 embroidery needle on the actual sports bag. When I was ready to stitch on the bag, I used some temporary spray adhesive to somewhat adhere the tear-away stabilizer to the back of the top flap. I used a chalk pencil to mark my vertical center and two horizontal lines to align my stitching. Then I hooped the bag flap in a 5x7 hoop, keeping the bulk of the bag to the left side. This took a bit of time . 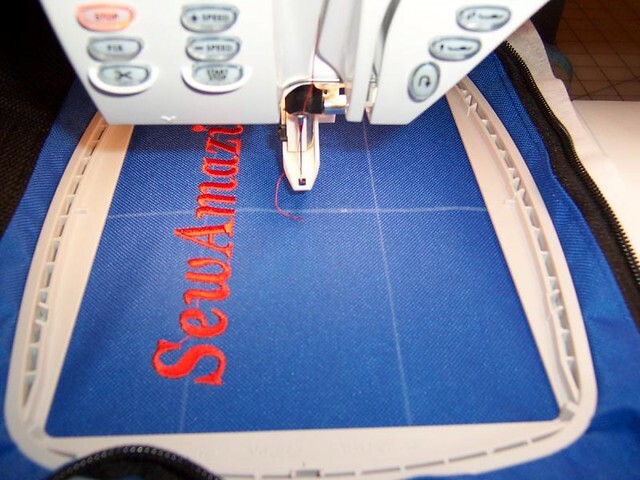 . . it was quite bulky, so I very carefully inserted my hoop onto the embroidery arm, making sure that no part of the bag would get caught up either in the stitching or on the embroidery arm. I used my Sensor Q foot for the first time on this project, and I have to say that I do like the results better than using the R foot. I still don't understand why the stitches look better, but they do! I stitched one line at a time on the next to slowest setting. There were some indentations from the hoop on the flap afterwards; I used a very cool iron and a light touch to smooth them out. A damp sponge helped remove the chalk lines. 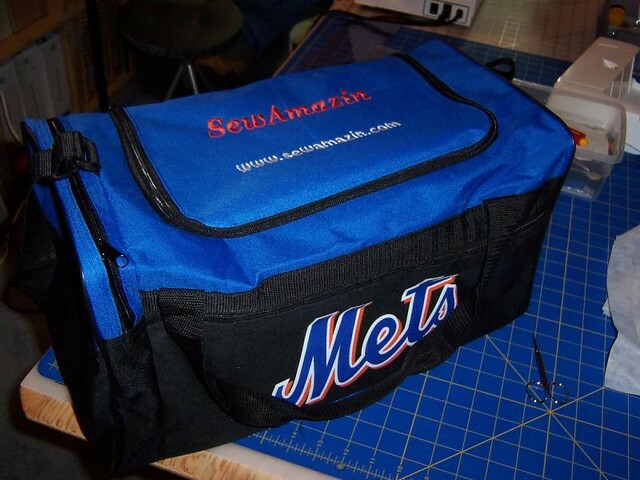 I'd like to add more embroidery to the ends of this bag, but I'm waiting to see what the post-season brings. I should be able to hoop it with a 100x100 hoop and manipulate the bag just enough to get it on the machine . . .I'd also like to make the shoulder strap detachable. Right now it is adjustable, but I'd like to be able to remove it. I need to find a source for the hardware; the strapping is 1-1/4" wide and all the clips and d-rings I can purchase locally are only 1" wide.